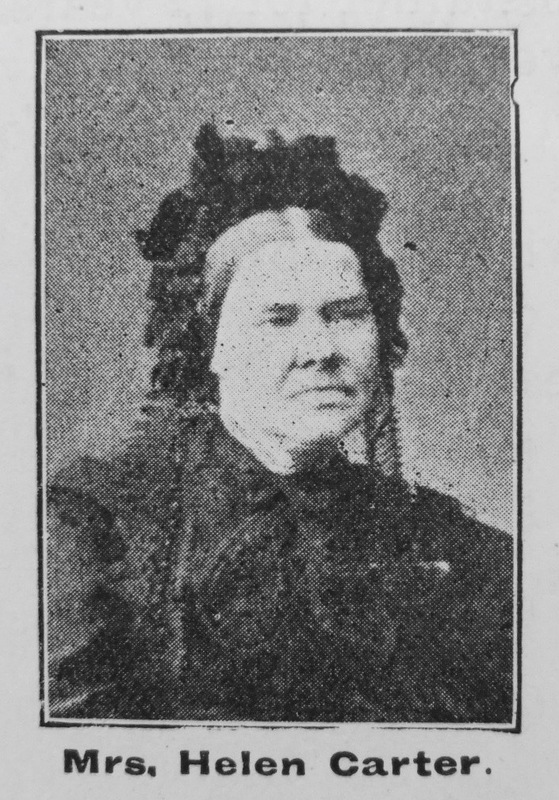 Helen Carter, widow of the late Robert Carter, of Sandycroft, Flintshire, North Wales, was born July 8th, 1818. She was the daughter of Mr. and Mrs. Williams, of Powy Lane. Helen became a disciple of Jesus while but a child, and was a member of our church for about 70 years. In 1844, she became the wife of Rev. Robert Carter, a godly and devoted man, then stationed at Darlaston, Staffordshire. For reasons we need not here detail, Brother Carter deemed it expedient to give up the ministry, in the official sense of the term; but, though he entered upon what is termed a secular calling, he was stlll, in the true sense of the term, a minister of Christ. Robert and his dear wife resided for a short time at Crewe, and then settled at Great Saughall. In 1863, they found their way to Sandycroft, near the celebrated Hawarden, the seat of of The Honourable W.E. Gladstone. At that time, there was no place of worship in Sandycroft, but even the G.O.M. and his noble family could not induce the Carters to become church people. They were loyal Primitive Methodists, and intended so to remain to the end of the chapter. They opened their own house for preaching services, and, by the blessing of God, they formed a society and erected a chapel, where the good work is flourishing at the present time. In 1870, noble Robert died, after a brief illness, and Helen was left with the charge of a business, three sons, and a daughter. How easy to record – “And she was a widow.” But how few the people who realise what is implied. But, despite the sorrow of bereavement, she heroically carried on the business, filled offices in the church, and entertained the preachers. On January 25th, 1900, the P.M. World Newspaper published a list of Total Abstainers – “The Total Abstainers’ Roll of Honour,” – with portraits of the 12 highest on the roll. Mrs. Carter was not only on the list, but occupied the premier position having been a pledged abstainer for 72 years. During the last few years of her earthly pilgrimage, she was an invalid, unable to attend the public means of grace. But, by the aid of a telephone, with a double transmitter, laid on from the chapel pulpit to her bedroom, she could hear the singing and follow the hymns in the book. She died, as she had lived, in the full assurance of faith, and in hope of a resurrection to life everlasting. Her remains were interred in Hawarden Churchyard, March 21st, 1902. Helen (Ellen in some records) married Robert Carter (1815-1870) in late 1845 in the Walsall Registration District. At the time Robert was a PM Minister. After leaving the ministry, Robert became a grocer and baker. Census returns identify four children.